The Scottish Terrier should be alert and spirited but also stable and steadygoing. He is a determined and thoughtful dog whose "heads up, tails up" attitude in the ring should convey both fire and control. The Scottish Terrier, while loving and gentle with people, can be aggressive with other dogs. He should exude ruggedness and power, living up to his nickname, the "Diehard." Soft coat; curly coat; round, protruding or light eyes; overshot or undershot jaws; obviously oversize or undersize; shyness or timidity; upright shoulders; lack of reach in front or drive in rear; stiff or stilted movement; movement too wide or too close in rear; too narrow in front or rear; out at the elbow; lack of bone and substance; low set tail; lack of pigment in the nose; coarse head; and failure to show with head and tail up are faults to be penalized. No judge should put to Winners or Best of Breed any Scottish Terrier not showing real terrier character in the ring. Click Here to Learn about breeder background checks on Scottish Terrier breeders if you are looking for Scottish Terrier puppies for sale. Click Here to learn how ResearchBreeder.com can help you find healthy Scottish Terrier puppies for sale.Scottish Terrier puppies for sale. Click Here to order a Breeder or Kennel Background Check on Scottish Terrier Breeders that may have Scottish Terrier puppies for sale. Click here to find the national breed club for Scottish Terrier puppies for sale. 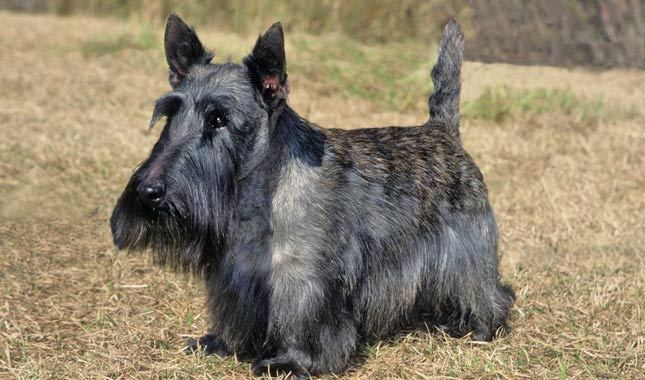 Click Here to purchase a list of approved ResearchBreeder.com Scottish Terrier Breeders who have Scottish Terrier puppies for sale.